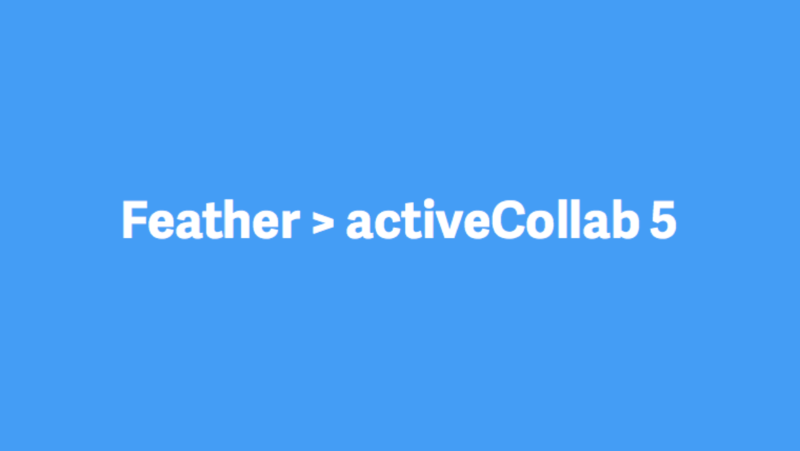 Feather is a codename for the new ActiveCollab. We wanted to clearly communicate to everyone in the team that the primary goal was lightness (a combination of reduced complexity, faster interface, and an airy visual feel), so we named it Featherlight. Also, the nickname of the UX designer who challenged our understanding of what ActiveCollab was and what it should be in the future is Pero (short from Peter, literal translation to English would be feather). The codename caught on and stayed in its short form - Feather. Now we like to look at it as a tribute to the project's main goal and the person directing our user experience efforts. Bumping a version number seemed like an obvious thing to do because we always did that. After v1 came v2, after v2 we had v3 and so on. Next major release is going to be a bit different because things have changed since the last version bump (to v4, in July 2013). In the past, we had users with self-hosted licenses and they could always stay with the system that works well for them if they didn't like what the new version had to offer. We still have a lot of customers who are happy with their v3 and even v2 installations (I am not sure about v1, haven't seen one in the wild for years). Cloud is a bit different because you don't control the version you use. It is always the latest and greatest that we have to offer. What happens when we launch a radically different version and you are our Cloud customer? The worst thing we could do is simply upgrade everyone and let them open a whole new ActiveCollab when they log in one morning, in the middle of the most important project they ever worked on. We all like to play with new software, but nobody (and let me repeat that, NOBODY) likes being forced to learn a new project management tool while handling an ongoing project. We understand that and we will keep version 4 running on our Cloud as long as there are customers happy with it. You don't like Feather? Fine with us, use ActiveCollab 4 for as long as you want - we'll make sure that it is stable and performing well. Want to try Feather before making the switch? Sure, that option will be available too. You'll be able to make a switch if you like it or continue to use v4 if you don't. Feather is more than ActiveCollab 5, it's the all-new ActiveCollab. Back in late 2013, we knew we were working with a great feature set but felt that the way forward wasn't just adding more features or flattening out the design. A fresh coat of paint or yet another power tool would not help us grow because user complaints were caused by deeper issues than the lack of features or 2011. design. Develop a new visual language. Not necessarily in that order, but close enough. Speed is important because the user experience suffers if the application is slow, no matter how well thought out or developed it is. Being accessible means that things "make sense" when people interact with the tool and complexity unfolds as the user starts using the tool more and more (and when they are more capable of absorbing it). New visual language is the obvious one - trends have shifted, expectations have changed and we wanted to offer a fresh new interface. Finally, housekeeping, the one that makes all the previous points possible. Some features are retired, others have merged, some have changed their names, and a lot of new ones have been added. We'll write about the details in our future posts. Personally, I think we've reached the goals set when we started this project. We'll dig into the details in our future posts, to show you our thinking behind some of the decisions and make you familiar with the improvements.